where $\theta_t$ is the current state of the parameters and $\Delta \theta_t$ is the update step proposed by your favorite optimizer. Often times, after $N$ iterations, we simply stop the optimization procedure (where $N$ is chosen using some sort of decision rule) and use $\theta_N$ as our trained classifier’s parameters. where $\lambda \in [0, 1)$ is the decay rate or momemtum of the EMA. It’s a simple modification to the optimization procedure that often yields better generalization than simply selecting $\theta_N$, and has also been used quite effectively in semi-supervised learning. Implementation-wise, the best to apply EMA to a classifier is to use the built-in tf.train.ExponentialMovingAverage function. However, the documentation doesn’t provide a guide for how to cleanly use tf.train.ExponentialMovingAverage to construct an EMA-classifier. Since I’ve been playing with EMA recently, I thought that it would be helpful to write a gentle guide to implementing an EMA-classifier in Tensorflow. For those who wish to dive straight into the full codebase, you can find it here. For self-containedness, let’s start with the code that constructs the classifier. So far, we’ve figured out how to create the EMA variables and how to access them. But what’s the easiest way to make the classifier use the EMA variables? Here, we leverage the custom_getter argument that appears in tf.variable_scope. According to documentation, whenever you call tf.get_variable, the default getter gets an existing tensor according to the tensor variable’s name. However, a custom getter can be applied to change the existing tensor that is returned by tf.get_variable. And that’s it! 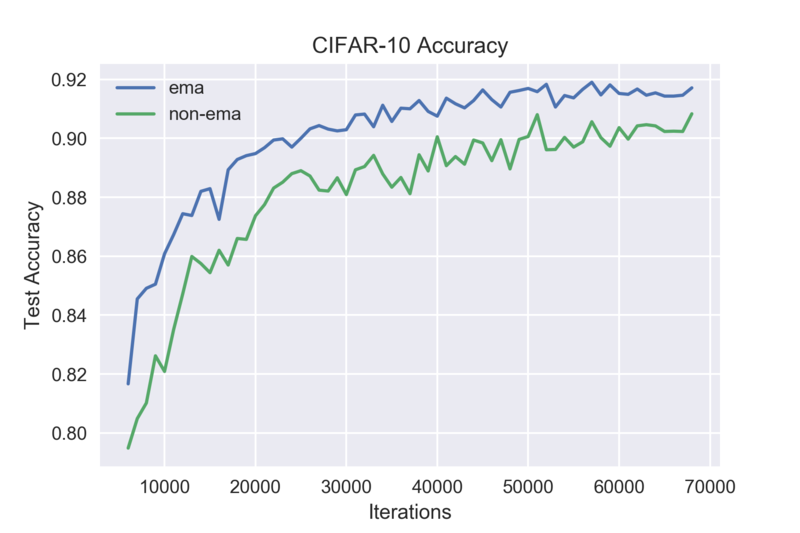 We can now verify that applying EMA does in fact improve the performance of the classifier on the CIFAR-10 test data set. You can find the full code for training the CIFAR-10 classifier below.